Your home is your palace, so why not make it as attractive and as comfortable as you can. Interior designers worked hard to learn the skills that allow them to showcase some of the best new types of decor and colors, with the “important job of keeping living spaces clutter-free, beautiful, yet still fully functional, as BrandonGaille.com notes. There are many trendy designs that can turn a regular room into one that’s spectacular for entertaining guests, or allow you to customize it to your ideal living space. Plus, with the latest technology there are all kinds of ways to include the latest and greatest aesthetics. 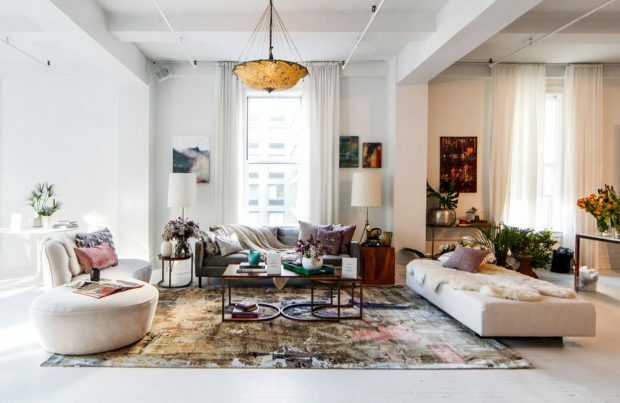 These are some of the most popular interior design trends this year, so you’ll want to take some notes and give your living quarters a fresh new look. Just a few years ago, wallpaper might have seemed like something out of the 1950s, but it’s been making a huge comeback recently as people turn their backs on those plain boring white walls. There are lots of wallpaper varieties available on the market that are perfect for sprucing up any dull, lifeless space in your home that needs a little something extra. Some of the patterns are so bold they are certain to replace a lot of artwork going forward in the future. One of the coolest additions that you can get for your home is a customizable light fixture to help set the tone of your environment. All kinds of modes, colors, and styles are available for just about any area in your house that you want to light up; some devices even sync up with music players too. A remote control outlet can even give you the power to control your lighting via a smartphone and often voice commands through devices such as the Google Home or Amazon Echo as well. Dimmer switches allow you to control the amount of light in your room, adding a bit of atmosphere to any occasion. There was a time where having a kitchen painted in light or even pastel hues was quite common, but dark kitchens have now lit the trend charts on fire. Not only is black a very sleek, modern color, but it also has the ability to hide spots and watermarks that would show up immediately on many white and lighter surfaces. That doesn’t mean going entirely black, but a black-and-white combination is retro cool. Gone are the days of boxy couches and bulky televisions. Now we’re going to much rounder and curvy furniture in order to soften the energy of a room. Not only do curved sofas look elegant, but they’re usually a lot more comfortable too. Painting your floors instead of actually replacing them with new tile is one of the more affordable ways to instantly upgrade your home’s look. It’s super customizable and can be made to match any color scheme in your home. Plus, it’s also the perfect way to completely change up and modernize all that old linoleum that’s dating your house.